Maybe it’s a delicious dish at your local pub, an elaborate coffee selection at a well-loved café or one-of-a-kind treasures from a shop you visit every weekend. However, there’s more to why you love these places than the products or services. Think about how you feel when you visit them. Relaxed and happy? Warm and cozy? Invigorated and energetic? Someone has carefully chosen the surroundings in your favourite places to develop an inviting space you want to spend time in. Why not do this in your own home? When you imagine a place you like, think about the lighting. Whether it’s candles or an overhead chandelier, lighting is one of the best ways to set the mood of any room. Add some ambient lighting to instantly make a space more inviting. A table lamp or wall sconce with a low wattage bulb will cast a soft glow in the room that will make everyone feel comfortable. Another cozy home décor idea: put dimmers on your light switches to dim overhead light fixtures for a romantic dinner or movie night. Next, consider the colours of your surroundings. Sometimes, a room can feel dark and gloomy even on a sunny day. Consider light, airy colours such as blue, yellow or violet for a sense of spaciousness and life. Darker, jewel tones will bring the room in to create a warmer feel – perfect for the bedroom or a living room where you spend winter evenings in front of the fireplace. Another home decorating idea you might not have considered: music.Music has a way of transforming your mood. After a long day at work, put on some soft music to soothe your soul. Turn up some upbeat tunes while doing housework – it will seem like less of a chore! You can also use sounds to “decorate” your home. How about trickling water or gentle music in the bathroom for a spa-like atmosphere? Put a set of windchimes on the patio to make morning coffee outside even more relaxing. Today’s wireless speaker systems make it easy to set any mood you like in any room. Use your imagination and bring the sounds you love into your space. Some people love the smell of freshly-baked cookies while others adore the scent of roses. 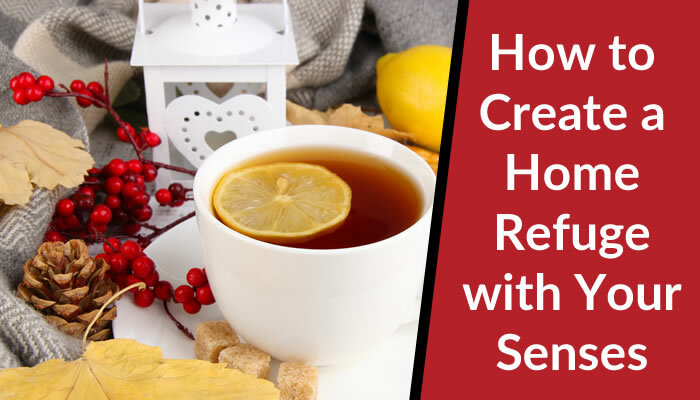 Recreate the smells you love at home using real flowers or scented candles. Just avoid too many competing smells in one room and avoid over-scenting an area. A diffuser with aromatherapy oils allows you to use your favourite scents to create cozy home decor – whether it’s energetic or relaxing. For example, lavender oil is calming, while lemon is more awakening. You can use different scents depending on the room, event and time of day. It’s also important to think about what people see when they enter your home. Does it look clear or cluttered? Of course, when a home is lived in it it’s not going to be spotless, but doing a little to add some welcoming, cozy home décor goes a long way. What do people see when they walk up to your door? Are the stairs covered in leaves or swept free of debris? Consider hanging a seasonal wreath on the door or placing a colourful decorative pot with a plant on the porch. Here’s my example of a neat home decorating idea: it rains a lot in the winter months in Vancouver. I keep a variety of umbrellas in a stand just outside my front door for quick access. And it looks cute too! Next, think about what people see when they first enter your home. Is the foyer table covered in papers? Set the tone for the rest of your house by adding a small table to hold a lamp, a dish for keys, a vase of flowers and a basket for mail. By using the senses you rely on every day, you can create a home refuge you’ll love coming home to. With these home decorating ideas and your imagination, I’m sure you’ll create a space everyone will love. 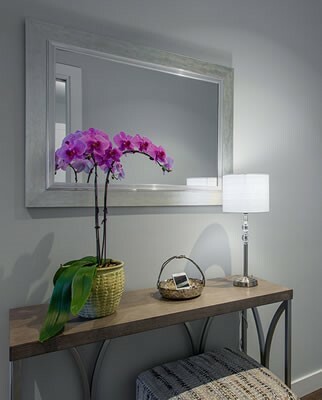 A Stroke of Genius is a full-service Interior Decorating Company in North Vancouver. 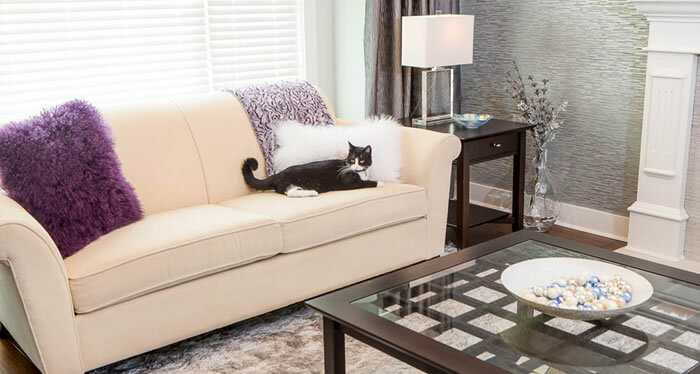 Interior Decorator Barbara Aylesworth and her team can work with you to develop your home decorating ideas to bring the sights, sounds and smells you love to life in your home. Contact us for a consultation today!